Homey, home-boy, homeland security, homepage, homing device: these are East Coast/foreign terms, newly recycled into the national lingo. Out west we say, “Give me a home where the buffalo roam...” You laugh. But have you been there and seen those brutes up close? Home on the Range being the great ecological song, as Odetta taught me, and the West being about place, the land, roots in dirt. Did you know the rock you’re sitting on was under the sea only a hundred million years back? 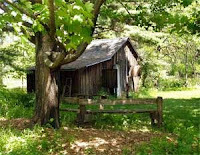 That’s Aldo Leopold’s shack in the photo, by the way. Whatever you do don’t look him up, don’t read A Sand County Almanac. No, no, heaven forbid. You might start reading Thoreau and Muir, Stegner and Maclean, Abbey and Dillard. Watch out. I warned you! Anyway, that is Leopold’s home. Nice, huh? What is this entry about? I just bought a house back in my home state of California, something I never thought I could do (sorry if the crisis is rough on you). And we spent the holiday/winter break personalizing, home-making, turning a bland crackerbox into a rat’s nest by living there, looking at the corners, breathing in the stale air, our human vibrations infusing the plasterboard. "Homeless, homeless, moonlight sleeping on a midnight lake …?" Yes, I have been; haven’t you? Did you see Into the Wild? My ending is different. Have lived in old trailers, on people’s couches and in shacks and garages and tents, a backpack and a car with curtains. And been on food stamps and Medicaid (my grandfather was outraged that a new college grad had to go on welfare!). But poverty lends perspective (when temporary), it doesn’t scare you into living stupidly once you know how little it all matters. Like traveling to a third world country in your own life. So I bought my first house at 50, and my second at 55. Never really thought of myself as the two-mortgage type. Maybe a hobo riding the rails, you know, with a guitar and a bedroll. Mid-Atlantic, in this case, using the guitar as a paddle. For most folks the fear is not having enough; for a few of us it’s having too much. Travel light is our mantra. Yet, here I am with two mortgages, happy as a squirrel in a nut tree. Home is a good place for love. Making, creating, fabricating, fashioning love from the essence of a place that is yours, your own place in the cosmic scheme. Not that a couple cannot become intimate in rented digs, on someone else’s furniture. Or rather, yes, I guess that’s what I mean. Buy it or build it or paint it pink or glue your own newspaper to the walls, but if there’s no place that mirrors and echoes your love, it’s a blind, deaf, roaming homeless love. You ought to fall in love in space like Disney birds, circle around a while, then come to earth and make a nest together. A silly idea, but worth trying. I’m not guaranteeing anything, just saying. And homesick? Have I been homesick these three decades of my adult life? Come on, Doc, what are the symptoms? What’s the cure? Is “best of both worlds” a cruel myth? Is “going native”? Straddling the border? Is the ex-pat a cry-baby? Or has it been effectively hard here where not a single person can pronounce my name? Crank up the self-pity machine and put “goin’ home” in a song for a sure hit. As for the ‘going home’ part of baseball, I’ll tackle that in an upcoming episode. Stay tuned. What else? The Bible, no less, says: Man goeth to his long home, and the mourners go about the streets. Oh, I didn’t want to talk about that. We all know that old joke. I’m talking about the next-to-final resting place now, the one where you sleep and then wake up refreshed, yawn and stretch in your own soft bed. Where the books aren’t holy, and the tragedy of death is measured in burnt toast. Or burnt down houses. Oakland Hills, Malibu, Santa Cruz County, Santa Barbara County, San Diego County, San Bernardino Mountains, Los Angeles County: thousands lost. “YOU’VE GOT THIRTY SECONDS TO GET OUT; GRAB ONE THING AND RUN!” My soul? My charming good looks? My insight into the secret workings of the universe? I’d probably just grab a scrapbook of photos and poems about my house, already lost in the fires of self-doubt. If being a man (or woman) is an act of courage, and courage is facing up to what scares you, maybe that’s ownership, roots, permanancy, the rut, the stagnation risk, prodigal boy returning like Thomas Woolf, knowing what he knew ... well, maybe it’s time. Maybe it’s finally time. Mutt: The short fortune teller escaped from prison. Mutt: She was a small medium at large. Jeff: Ow. How about the thief who stole a calender and got twelve months? Mutt: How about the thief who fell and broke his leg in wet cement? Jeff: Can I guess? He became a hardened criminal. Mutt: Okay, how about the thief who stole corn from a garden and was charged with stalking? Jeff: The police were called to a day care center where a three-year-old was resisting a rest. Mutt: Oh no, officer. I do not wish to give up my right to remain silent! Jeff: You said it, man.